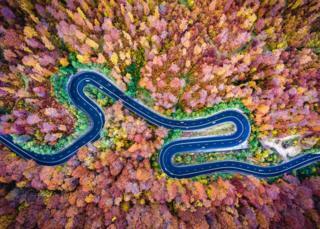 Jaw-dropping pictures taken from drones capture extraordinary views that the human eye may otherwise not see. 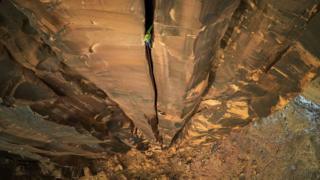 Image caption Max Seigal shot this awe-inspiring photograph of a rock climber scaling a cliff in Moab, Utah. 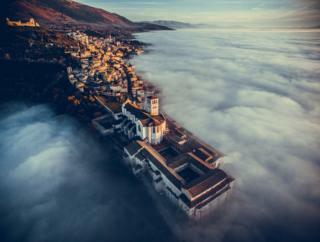 Image caption Swathed in fog, the Basilica of Saint Francis of Assisi in Umbria, Italy, looks beautiful as the setting sun bathes its towers in light. 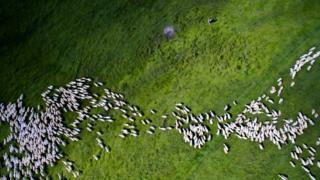 Image caption Clusters of white sheep are seen scattered over the vibrant grass of Romanian fields. 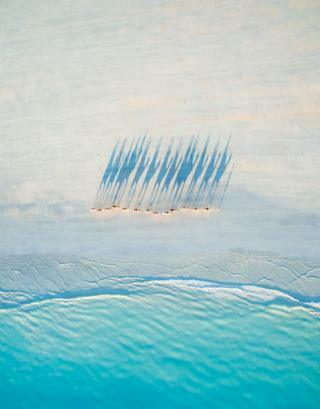 Image caption Long shadows are cast as a caravan of camels walks along Cable Beach, West Australia, at sunset. 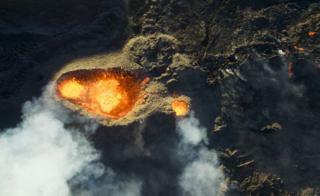 Image caption Appearing through the steam and gas is an impressive aerial view of an erupting volcano on Reunion Island. 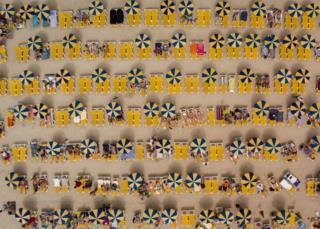 Image caption Rhythmic patterns of umbrellas and beds during summer on the Playa de Amadores in Gran Canaria. 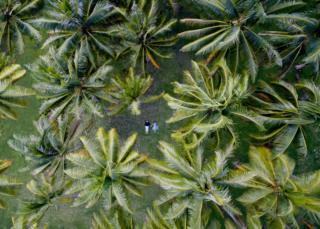 Image caption Surrounded by moving palm trees, a couple lie together in a clearing on Huahine island, French Polynesia. 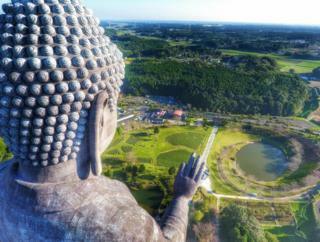 Image caption The huge bronze Ushiku Daibutsu statue looks out over the verdant landscape of the Ibaraki Prefecture, Japan. 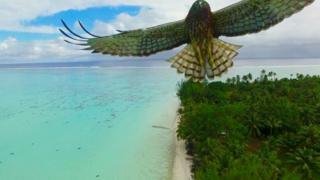 Image caption By chance, a drone catches a bird mid-flight over the paradise of French Polynesian beaches. Image caption Sighisoara, Transylvania, is the birthplace of Vlad the Impaler - otherwise known as Dracula - and this shot imagines what he might have seen on his nocturnal flights. 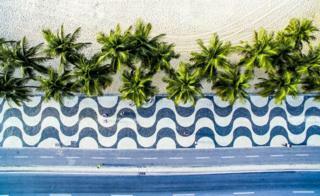 Image caption Shaded by palm trees, pedestrians make their way along the striking graphic pavements of Copacabana beach, Rio de Janeiro. 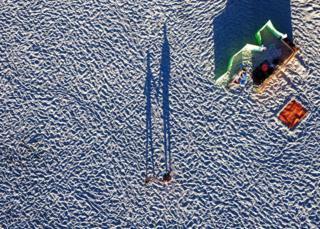 Image caption The low sun creates long shadows, and impressive patterns, across the ridges of the sand on this Polish beach. 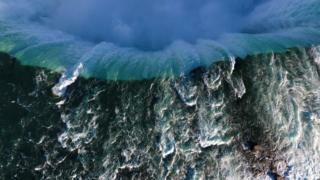 Image caption Water thunders downwards as the drone hovers over Niagara Falls. 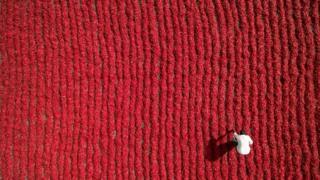 Image caption This farmer in Guntur, India, is a lone white dot in a sea of bright red chillies. 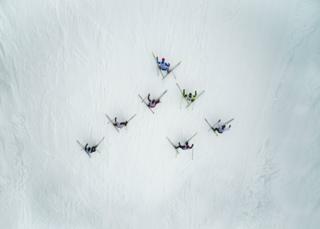 Image caption A formation of skiers on a frozen hillside of the Adzhigardak mountain, Russia. 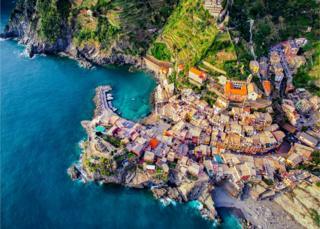 Image caption An idyllic view of the brightly-coloured buildings of the Italian seaside town of Vernazza. All photographs published by Dronestagram.